In the more than 20 years that the PC-12 has been in production, Pilatus has made numerous updates to the original design. In 2008, Pilatus debuted the PC-12 NG (Next Generation), to instant popular acclaim. While early PC-12s were powered by a Pratt & Whitney PT6A-67B, the later NG models use the more powerful PT6A-67P. The maximum takeoff weight was also increased, and the entire avionics system was upgraded to a glass cockpit display. 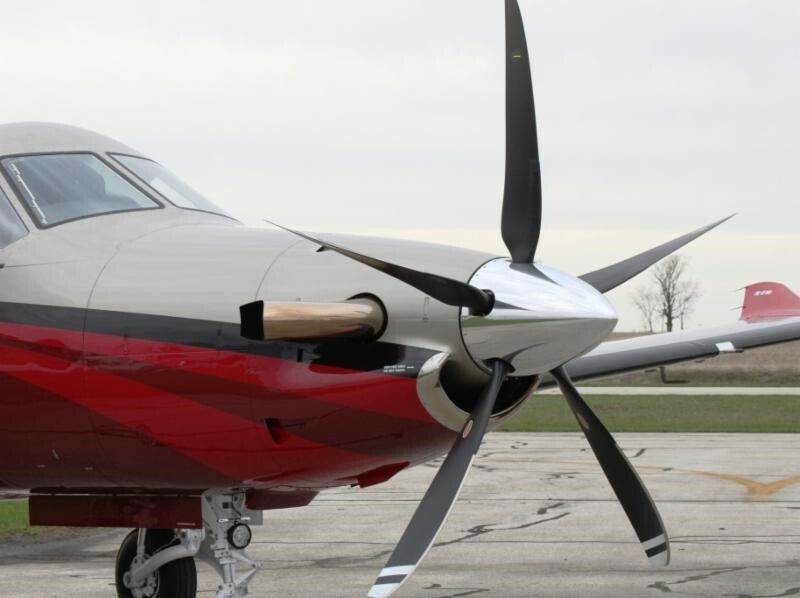 In 2015, Hartzell Propeller introduced a five-blade composite, swept-tip propeller specially designed to maximize performance for the Pilatus PC-12 NG fleet. The advanced prop allows the PC-12 to cruise five knots faster (max cruise speed is 285 knots), climb to an altitude of 28,000 feet 10 percent quicker, and offers a 50-foot reduction in total takeoff distance. Often called the “Swiss Army Knife of aircraft,” the PC-12 NG has gained a reputation for its astounding versatility. Equipped with trailing-link landing gear, it’s one of the few pressurized turbine-powered aircraft capable of operating from unpaved airstrips as short as 2,600 feet in remote locations such as the Australian outback. The PC-12 is also known for its exceptional comfort and luxury. With 330 cubic feet of cabin volume, the latest model can seat up to 10 passengers, although it’s more commonly configured in a 6-7 seating arrangement. The aircraft also provides ample room for cargo. In addition to the main passenger entry door, the PC-12 features a standard cargo door, which allows a fork-lift to load luggage directly into the cabin. According to Pilatus, the global PC-12 fleet has flown more than six million hours and has been deployed in a variety of different roles and special missions around the world, including medical assistance, aerial surveillance, cargo transport, search and rescue missions, and business travel. In 2017, Pilatus handed over the 1,500th PC-12 to one of its most loyal customers, the Royal Flying Doctor Service of Australia, a charitable organization which provides medical assistance to people in remote areas.